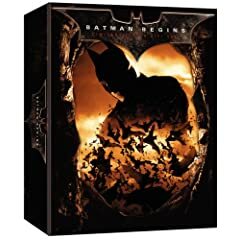 With the release of the latest Batman film, The Dark Knight, less than two weeks away, no less than three Batman DVDs are out this week (not including special or Blu-Ray editions): Batman Begins, the fifth season of the television series Batman and the animated Batman - Gotham Knight. The Criterion Collection releases Claude Jutra's Mon Oncle Antoine (lauded by many as the greatest Canadian film of all time) tomorrow, as is Ramin Bahrani's Chop Shop. Among the television seasons I am most anticipating are the fourth season of Stargate Atlantis and (for my wife) the third season of Dog Whisperer with Cesar Millan. Documentaries hold the strongest appeal for me this week, however. The Atheism Tapes and Welcome to Amish America are high on my shopping list. What are you planning to buy or rent from this week's new DVD release list?